Pasochoa 4.199 m. / 13,772 ft.
Rumiñahui 4712 m. / 15,455 ft.
Corazon 4788 m. / 15,704 ft.
Guagua Pichincha 4780 m. / 13,772 ft.
Imbabura 4.630 m. / 15,190 ft.
Quilotoa 3900 m. / 12,792 ft. If your purpose is to ascend one or more of the great summits of Ecuador, our trekking peaks are the best way to start a perfect acclimatisation program, or if you just like the contact with nature and enjoy hiking, Andean mountains and lakes are the best scenario. There is also the option of spending one or more nights in one of the many historic haciendas in the mountains. Below you can check some options of our trekking/acclimatisation peaks. Guagua Pichincha 4780 m. / 13,772 ft..
Cuicocha 3200 m. / 10,496 ft. Accommodations in cities or mountains. Our trekking activities and mountaineering programs are rated in two major aspects: physical and technical. For both of them we divide into four levels: easy, moderate and intermediate. The levels are assigned depending on the number of walking hours, elevation gain and the technical terrain on the mountain and walking area. 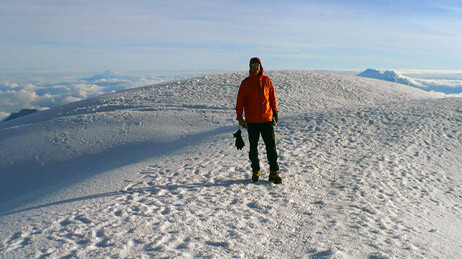 The hiker should cover up to four hours of walking on a marked and easy trail with few slopes up to 35 degrees. Technical equipment is not required. The hiker must be in good physical condition. Hikes usually extend from four to six hours on a path at times not well marked with one or two delicate steps where a safety rope will be necessary. It is mandatory very good physical condition. This case generally applies to our mountaineering trips where the effective walking hours exceed six and can be extended up to nine hours round trip. Technically speaking, these activities generally occur in areas covered with snow and glacier where technical mountaineering equipment is mandatory. Climbable all year-round, however the best climbing months are: November through February. Rainiest Months: April and May. Some technical and group equipment (if needed) will be provided by our guides. NOTES ON THE ITINERARY: Although we do our best to adhere to the schedule listed above, the day-by-day activities and camping locations listed on this itinerary are subject to change for numerous reasons beyond our control including group pace, acclimatisation, weather, trail, on road conditions and/or water availability at the campsites according to the time of the year. Hiking distances and altitudes are approximate, and times indicated are net hiking or driving times that do not include lunch breaks, rest stops, time to explore the area, etc. This program is suitable for physically fit participants accustomed to outdoor activities. Contact Us.